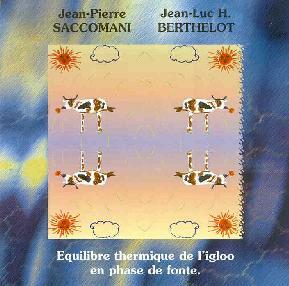 Jean-Pierre Saccomani & Jean-Luc H. Berthelot - "Equilibre Thermique De L'igloo En Phase De Fonte"
Having heard two releases by Jean-Pierre Saccomani and several from Jean-Luc H. Berthelot (who records as "Tales") it was a pleasure to hear these two imaginative French electronic artists combine their efforts. The music is characterized by elusively busy electronic passages that blend intensity, serenity and majesty. Saccomani and Berthelot paint carefully structured landscapes that bring to mind the cinematic orchestral qualities of Vangelis, but also the classic kosmiche of early Tangerine Dream. Drifting angelic chorus' soothe the senses while heavenly space atmospherics expand the mind. Saccomani and Berthelot excel at creating slowly and quietly, but ever so carefully developing themes that utilize multiple sound patterns and textures, and come together to create music that is rich in color and imagery. It's a beautiful balance of soundscapes, symphonics, meditative bliss, and cosmic space. I recall having noted in an earlier review that I felt Saccomani fell a little too much in the New Age category, but the music on Equilibre Thermique De L'igloo En Phase De Fonte reveals a thoughtfulness and sophistication that is well beyond the New Age realm. Headphones are highly recommended to absorb all the subtle pieces that make up the whole of this work and multiple listens will bring the reward of many new discoveries. Contact via snail mail c/o Jean-Luc H. Berthelot; Resid. Gaston Roulaud; B5/817 93700 Drancy; France.